The Basra protests are gaining pace despite Baghdad's attempts to calm the ongoing turmoil down. Speaking to Sputnik, Iraqi analysts opined that the demonstrations may lead to certain political changes and expressed concerns over Washington's potential attempts to take advantage of the protests. 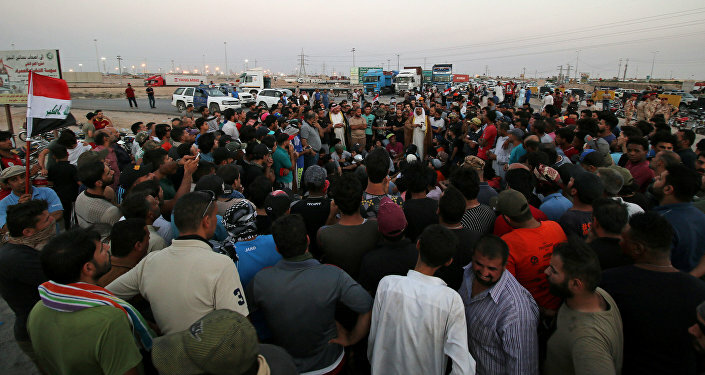 The continuous protests in the Iraqi city of Basra that kicked off on July 8 have nothing to do with an inner political struggle, Iraqi military strategic analyst Qasi al-Muatasem told Sputnik Arabic, dubbing the unrest "the revolution of the hungry." "The province of Basra gives the Iraqi government more than 95 percent of the oil extracted on its territory," al-Muatasem underscored. "At the same time people are suffering a lot from the lack of elementary things, for example, drinking water and electricity. In addition, health care is in a dire condition, unemployment remains high, and so on. Of course, people are dissatisfied with the government." Meanwhile, the Basra unrest caught its second wind on July 15 claiming the lives of two Iraqis. Some banks stopped operating due to safety concerns. A number of employees of foreign oil companies were evacuated, while the region's authorities have taken measures aimed at boosting the protection of oil and gas facilities. Access to social networks has been blocked. When trying to reach their accounts, users see a message saying that the Iraqi Ministry of Communications has forbidden access. Al-Muatasem pointed out that the protests had already engulfed 13 regions of Iraq. He stressed that the Iraqi government had failed to deliver on its promises made back in 2005. According to the analyst, the demonstrations could lead to nothing short of a revolution. "The Iraqi people have found themselves amid a crisis, fighting hunger, disease, chaos," al-Muatasem said. "It has turned out that the people [of Iraq] who live in the resource-rich country are forced to look for bread in the garbage dump." He opined that the protests could lead to substantial political changes in the country, as the Iraqis no longer trust Baghdad. For his part, Heidar Gazi, a Baghdad-based foreign affairs analyst, suggested that Washington may take an advantage of the protest movement in the south of the country "to introduce its agents of influence into the Iraqi government." "Thus, [Americans] will influence the decisions of the government, and therefore, benefit," Gazi presumed. "Americans often intervene at the last stage, as it was with the war on terrorism. They kick off events, then keep an eye on the unfolding situation and intervene at a favorable moment." Earlier, Iraqi Prime Minister Haider Abadi announced seven decisions to meet the demands of the protesters. He signaled that the government would allocate 3.5 trillion Iraqi dinars (around $2.5 billion) for water desalination, cope with electric power outages, provide necessary medical services to the residents of Basra and invest into the region's infrastructure and the creation of jobs. The government has already established a special committee aimed at meeting the demands of demonstrators. However, it appears that the announcement has failed to calm the turmoil down. Baghdad has yet to form a new government after the sweeping victory of Iraqi Shiite cleric and politician Muqtada al-Sadr and his Sairun coalition on May 12, 2018. Thus, it still remains unclear whether Abadi will stay at the helm. On July 12, Turkey's Anadolu Agency reported that al-Sadr urged the prime minister to leave the pro-Iran Islamic Dawa Party "in return for securing a third term in office," while seeking to form a government "far from sectarianism or narrow political interests."